So I think that I'll be six now for ever and ever." Sometime yesterday greentapestry officially celebrated six years of blogging. I say officially because although my very first post was back in 2005 I did not go public until 2008. This was the year when work ceased to be a factor in my life. With a job that had changed beyond recognition I decided to take an offer of voluntary redundancy. Suddenly there was so much more time on my hands. After a heady summer of freedom, I decided that as well as already visiting a number of gardening blogs I would open the doors to mine. My very first comment came from the lovely Michelle over at Veg Plotting. I can still remember how excited I was. In those days finding your way round the gardening blog community was greatly enhanced by the existence of Blotanical, which sadly seems to have disappeared without a trace. Through Blotanical I met many other like minded souls some of whom who are still blogging. I'm fairly sure that Grace who blogs over at Gardening With Grace arrived at Blotanical in the very same week. Grace has now written a book about her gardening experiences entitled 'Grace in The Garden : Thirty Years of Blunders and Bliss', which I recently read on my Kindle. This is a book which found me nodding my head and chuckling throughout. It's perhaps more difficult now for those arriving on the garden blogging scene. There are so many more gardening blogs out there and there does not seem an ready-made mechanism like Blotanical to effect introductions to the blogging community. I would like to take this chance to point visitors in the direction of a new blog that I have recently had the pleasure of visiting. This is 'Our Garden@19'. Do pop in and say hello to Brian who has has just started on the blogging journey and who will be opening his garden in Worcestershire, for the very first time next year under the auspices of The National Garden Scheme. As I start my seventh year of blogging (no I'm not staying at six for ever and ever) I'm hoping to get to grips with the spring cleaning and updates that I mentioned a year ago and have still to start - hangs head in shame! Thanks so much to all of you who have stopped by to visit over the years and who have taken the time to leave a comment. Your words of encouragement, observations, suggestions, gifts and humour are really appreciated. I only wish that I could send you all a bunch of flowers to say a BIG thank you! Still sitting in a pot on a rather soggy Saturday is one of my latest foliage purchases heuchera 'Georgia Plum'. I bought this earlier this year from Plantagogo at the Southport Flower Show. Plantagogo is a fairly local concern being a Cheshire based nursery specialising in heucheras, heucherellas and tiarellas. The nursery holds national collections of both heuchera and heucherellas and away from home have been gold medal award winners at all the major flower shows. Owner Vicky Fox also gives talks to gardening societies and other organisations. She has visited our local gardening club a couple of times and is one of those speakers who is so enthusiastic about their subject that you feel you could listen to them time and time again. I mentioned earlier this year that one of my projects this year was to bring back some permanent mainly foliage container planting to the north facing courtyard outside the front door. I've failed abysmally so far so baby steps from now on so that hopefully I can achieve this goal during 2015. 'Georgia Plum' should fare nicely in this spot. I have a couple of companions in mind for her so far which are lurking ready made in the cold frame. They are an ophiopogon nigrescens and some early flowering galanthus 'Faringdon Double'. I'm intending to add a couple of other ingredients to the mix but am not sure what yet. I also need a new pot so sometime this week hope to locate both a pot and some more plant material that would be happy in shade. Any suggestions would be welcome. In the meantime I'm off to have a look at Christina's monthly foliage day meme over at 'Creating my own garden of the Heserides' for some inspiration. And they are better for her praise". - 'My November Guest' by Robert Frost, 1874 -1963. 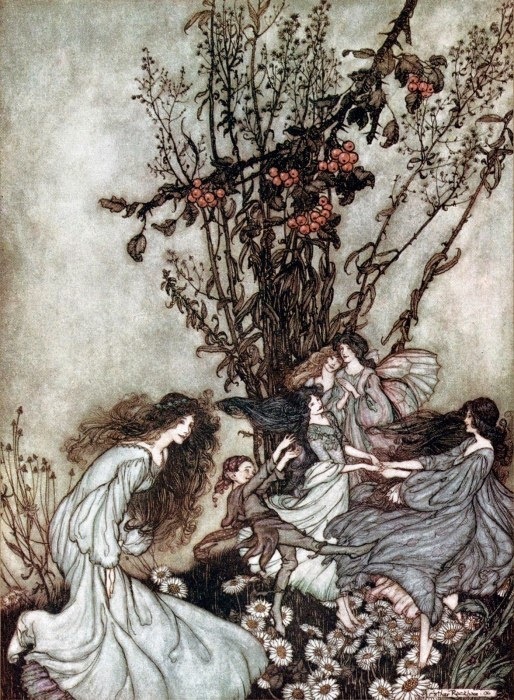 Illustration - 'Dancing Fairies' by Arthur Rackham, 1867-1939. Deserving of a long service award is erigeron karvinskianus formerly known as erigeron mucronatus, which flowers from as early in March right up to the first frosts. It is dotted about our shady north facing courtyard and would probably be more floriferous, even at this time of year if it was able to sunbathe. Still those dainty little daisies bring cheer on gloomy autumn days as they greet me on leaving and coming home. Below glimpses of this plant in full summer mode taken earlier this year at Sizergh Castle in Cumbria, gives some idea of their inclination to self seed with gay abandon and their ability to grow in seemingly somewhat inhospitable territory. Apart from its long flowering period another attraction of this little daisy is the way the flowers change from white to pink as they age. It can be grown easily from seed or bought as a plant although I think that the latter option is usually relatively expensive. This plant has been growing in our garden for many years surviving both what winters have thrown at it and himself's attempts to kill it off. He regards it as a weed! Thanks go as always to Gail over at May Dreams Gardens, who kindly provides us with the opportunity to wonder at other bloggers seasonal blooms every month. My willow has stood on tippy toes during the last month and has shed all bar a few leaves which are still clinging tenaciously atop of the branches. It's rather windy today and I'm not sure whether there will still be any hangers on tomorrow. There was no dramatic autumnal colouring up with my tree but a subtle thinning away. As Chloris from 'The Blooming Garden' commented in October "You will probably see the real difference next month when all the leaves will have faded away like silver ghosts" and that indeed is what has happened. The foliage around the base has died down considerably now enabling a glimpse of the stream which runs close by. You will often find willows growing near to water and the word 'salix' which is the genus they belong to derives from the Celtic word, sal (near) + lis (water). Our willow is on the opposite bank of a small surface water stream which runs alongside one boundary of the garden. 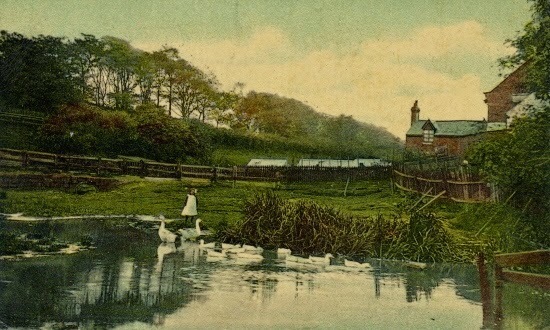 Some time ago by sheer serendipity I stumbled across a photograph which shows the lie of the land just over a hundred years ago in 1913, when it was decidedly more watery than it is now. Both the pond, cottages and greenhouses have gone but we do still get ducks swimming along the stream. I can't make out any definite willow form in the photo or work out exactly where our house is now, which is rather frustrating as it would be brilliant to pin an age to the willow, but I can see why the willow whenever it arrived chose to make its home in such a spot. 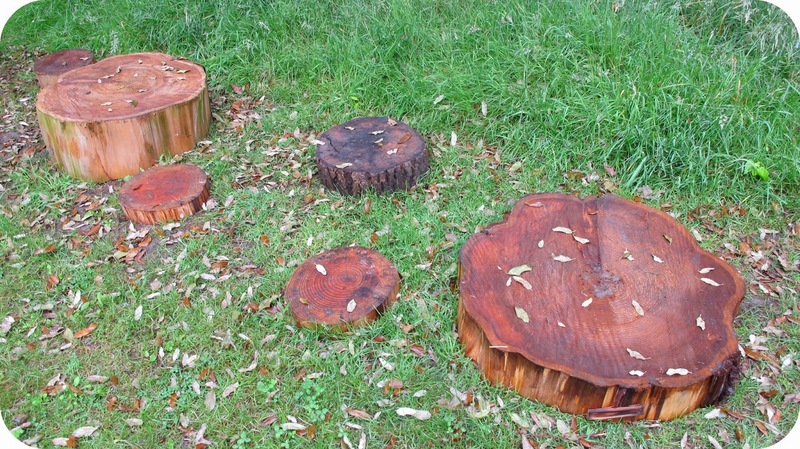 To see what other trees are up to this month do visit Lucy over at 'Loose and Leafy' who came up with the great idea of tree following over the course of a year. hardy fuchsia - name unknown as grown from a cutting from a roadside planting which was taken many years ago. The fuchsia concerned retained foliage during last year's warm winter and flowered prolifically earlier in the year. However it's still sending flowers out now but not as many as it does most autumns. hardy geranium - name long forgotten and a bit of a rampant self seeder. rose 'Blush Noisette' which has still not given up the ghost. leycesteria formosa also known as the Himalayan honeysuckle. lonicera nitida' Baggesen's Gold' which is in desperate need of a severe prune. I've fiddled about since the photo was taken and removed some of the leaves from the leycesteria and am happier with these pickings. The vase has featured on the blog before but not for a long time. It's a small bone china milk jug that hails from Staffordshire, which I think was passed on to me by my mum some time ago. Although I have not been a regular contributor to the 'In A Vase On Monday' meme, I've so enjoyed visiting those of you who have posted your vases throughout the year. I've picked up many useful hints and tips on flower arranging and conditioning. I've also learnt to think more outside the box about the material that can be used, picked up some useful photography tips and my wish list has grown and grown. A HUGE thanks and a virtual bouquet to Cathy over at 'Rambling In The Garden', who came up with the inspiration for this meme and who has throughout the course of a year kept it running like clockwork. It takes some organisation and dedication to stay with such a concept. Cathy is full of enthusiasm and encouragement too so if you do join in if you have not done so already. Don't be shy! Many congratulations Cathy on the first anniversary of this meme and long may it continue! Some plants stop you in your tracks and this is one of them. In the depths of winter last year himself and I went on an outing to London to visit the RHS show. Now whilst there were plenty of snowdrops that dazzled me with their markings, the one plant that held me spellbound was not a snowdrop. It was a plant that had been planted amongst a display of snowdrops on the Avon Bulbs display stand, where its contrasting foliage was so effective. The plant in question was lunaria annua'Chedglow' and it was one of those cases where I wanted to get my paws on the plant immediately. There were none for sale that day so on arrival home I did some online research but met with a brick wall the search went on hold. However when my Avon Bulbs catalogue arrived at the end of the year I noticed with great joy that there were seeds for sale! Loud whoops of joy greeted this discovery, seeds were ordered and duly sown this summer. Germination was successful, a friend kindly cared the teeniest baby seedlings when we were on holiday, they returned home where they grew bigger. Yet my plants are looking decidedly ugly at the moment - they seem to have the plant equivalent of measles. I'm hoping that this is a temporary feature and that as the weather gets colder that the foliage will develop an even purple/chocolate hue. If this doesn't happen they will not be the perfect companions for snowdrops or any other winter flowers and could well end up on the compost heap. Never mind the lilac flowers that will follow and subsequent shimmering translucent seed cases. Has anybody else grown this plant from seed and if so have you had the same experience with your seedlings? If my memory serves me well Caro from The Urban Veg Patch was also bewitched by 'Chedglow' and there may also be other bloggers too who have obtained seed. In other seedy news I've noticed on the RHS website that members can now now order from their seed scheme. I've not made use of this membership perk before but thought that I would try it out this year. Pen and paper will be the order of the day later when darkness falls. I'm one of those wimps who does not put their nose out of the door on Guy Fawkes Night. What about you when it comes to fireworks - frit or fan?